Samuel Laboy was born in Puerto Rico. He obtained his degree in Civil Engineering at the College of Engineers and Mechanical Arts in the city of Mayaguez (1958), and his Master’s Degree (1970) in Civil Engineering from the Oklahoma State University, at Stillwater, Oklahoma, USA. 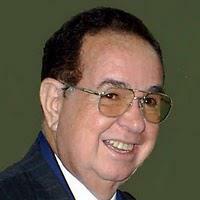 He dedicated most of his professional career to work in the Public Service in the Government of Puerto Rico. While in the Public Service, he received in three different occasions (1976, 1984 and 1990), the Manuel A. Pérez Award, the highest ranking Award granted by the Government of Puerto Rico to their employees (over 300,000 employees). Laboy performed outstanding work as a professional bridge engineer in charge of the inventory, inspection and evaluation of over 2,000 bridges in the island. As inventor, he received three patents from the United States Patent Office for his inventions of a portable pedestrian bridge structure, a soil classification device, and a guitar-teaching device. He is the author of the Spanish books “La Gran Pirámide y su Geometría” published in 1982, La Gran Pirámide y su Solución Geométrica (manuscript). He also published the book “A Civil Engineer looks at the Great Pyramid” (2008), and its “Supplement (2010)” in English. Laboy dedicated a personal crusade for over 40 years of studies and investigation devoted to the solution of the geometrical design of the Great (Khufu) Pyramid in Egypt. He envisioned this topic for his doctoral thesis, in his advance studies at the Oklahoma State University in 1970. Although he could not get back to his doctoral degree, he continued his investigation and research as a “virtual thesis”. He finished his goal in 2010, and presented his report books to the University, which consisted of the virtual thesis report books. 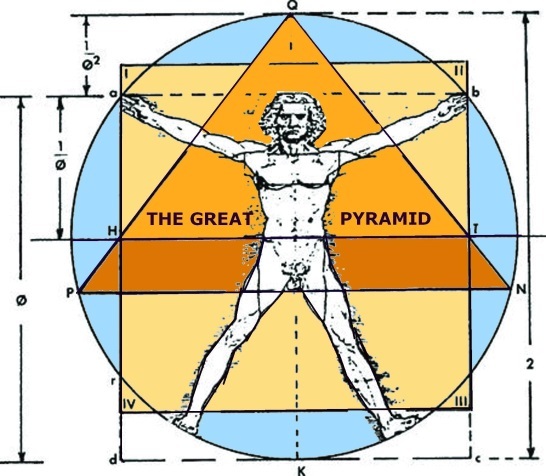 They included the entire design plan of the Great Pyramid, where he reveals his extraordinary findings and discoveries, as a result of his serious, profound, and comprehensive research. He explains that his findings and discoveries are not theories; they are real, facts, and something that anyone can rework and will get equal results and conclusions. He dedicated his virtual thesis work to the Oklahoma State University Faculty and to its Students. For many years, we have heard and read about the Great Pyramid of Egypt and the Ancient Egyptian culture, which is known as the Pyramid Builders. Many books and movies present theories about this culture based on extraterrestrials, their relation to the Cosmos, and to our Planet Earth. Continuously, we are subjected by authors to new prophesy and predictions about the Great Pyramid, new versions are inspired every day. However, all of these are theories, ideas, and the opinions of what many people think about these matters. At this time, I will present my views about this topic, but they are not supported in phantasies, theories, or restrictions protocols from any special organizations. My views are the results of my personal crusade for 40 years in investigation, research, and a visit to the Giza’s pyramids, using my Engineering knowledge, all reference books available from Egyptology from recognized authors about this matter. My presentation about the geometric design plan of the Great Pyramid is something real, a fact. After I received my Master’s Degree Diploma in 1970 from the Oklahoma State University, in Stillwater, Oklahoma, I decided to select the topic “The Geometric Solution of the Great Pyramid of Egypt” as my intended doctoral thesis topic, in my PhD advance studies. However, since I was not able to continue my doctoral studies, I decided to start and continue my studies in my projected thesis. It took me 40 years to finish my virtual thesis. Examining the pyramid’s structure “as built plan” I figure out that such a large and complex design project required “an architectural geometric template frame” for its design. I tried by all means to find this type of template. Since I could not find it, establishing my own parameters, I created, or developed it. It took me several years, but I found what I was looking for. The template’s shape consists of the geometric arrangement of a circle, a triangle and a square. They are drawn following a special geometric sequence, using only as tools, a drawing compass to trace the curves, and a straightedge to trace the straight lines. The importance of these combined figures is that they are proportional to the radius of the circle. The template can be seen and used, as a design tool full of extraordinary features for the design of different objects; such as paintings, statues, jewelry, temples, pyramids, and other types of structures. It has to be noted, that it creation is independent from the design of pyramids. The template can be created in any part of the world, with no reference to the pyramids. It is a product from the science of geometry. This architectural template exactly represents the one I envisioned was used by most ancient cultures of the world, for their uniform design of general construction works. The Perfect Symbol template has no dimensions. However it is surprising the extent of extraordinary properties and characteristics that this simple architectural symbol exhibits. 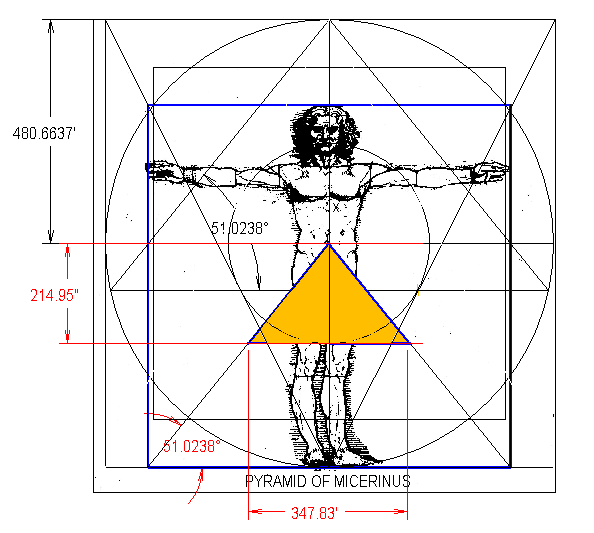 The entire Great Pyramid’s dimensions can be calculated using the desire units of measurements. Any number and unit of measurement can be used as the radius of the circle, such as feet, meters, inches, Egyptian Cubits, or any other measuring unit of our preference and all dimensions will be expressed in the same units used for the radius. Therefore, it can be said that the construction plan of the Great Pyramid is available now in any unit of measurements. Set the radius of the circle and calculate all the dimensions shown in the dimensionless plan. 1. The origin of the Perfect Symbol has no relation, or reference, to any pyramid, building, or religious temple. Its figure is generated from the science of geometry. 2. 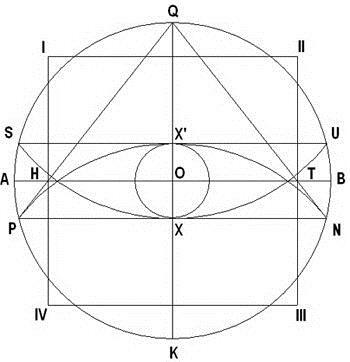 The Perfect Symbol is dimensionless; since it was created using only a drawing compass and a straightedge, without numbers, calculations or formulas; just the architectural template and a geometrical process was used. 3. Setting the radius of the circle equal to one unit, all dimensions, including its angles, can be calculated, or developed into formulas. Therefore the distance between any two points can be calculated multiplying the number set for the radius by the shown formula. 4. As said, when a number and its unit of measurement are set for the radius of the template, the entire geometric plan of any designed object can be calculated. As said, all the results will be expressed in the same units used for the radius. 5. Apparently, this architectural template was known and used by many ancient cultures to create their design works. For examples: the Aztecs in Mexico, the Incas in Peru, the pyramid builders in Egypt, and others. The geometric arrangement of this template seems to correctly fit their construction works. For this purpose, I developed a series of formulas which give the distances between the required points in any unit of measurement. Multiply the radius-size and unit, by the shown formula, and the result will show the distance between the two points. 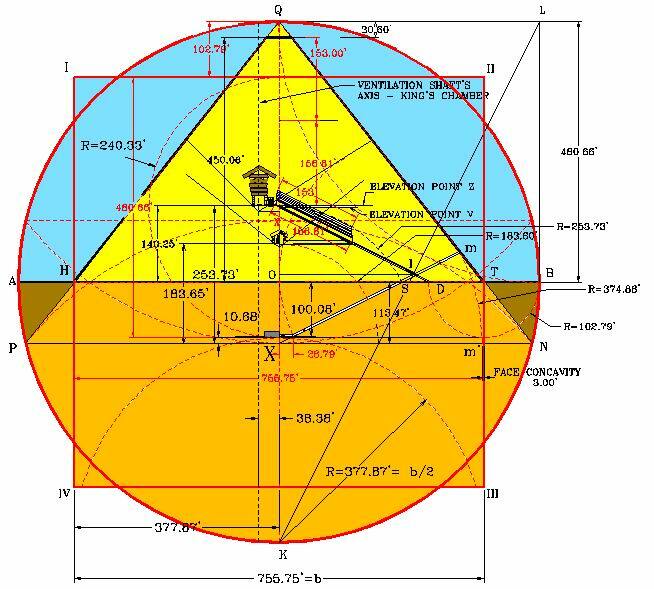 THE SHOWN FORMULAS ARE USED TO CALCULATE THE DISTANCES BETWEEN THE SHOWN POINTS FOR ANY PYRAMID’S PLAN, PROPORTIONAL TO THE GREAT PYRAMID’S STRUCTURE. 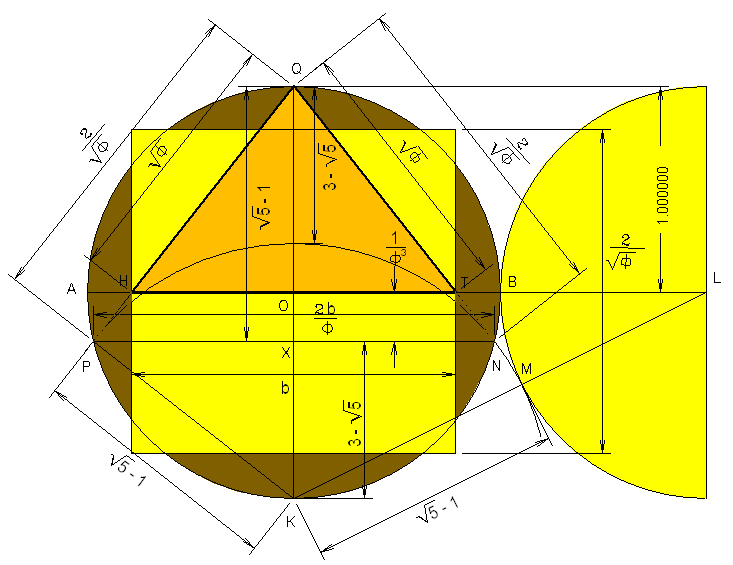 I found that the radius of the circle for the Great Pyramid’s design plan exactly corresponds to the product of 153 multiplied by Phi (= 1.6180339…) = 480.6637 expressed in ft. units. DISTANCE BETWEEN POINTS = THE PRODUCT OF THE NUMBER OF UNITS SET FOR THE RADIUS, MULTIPLY BY THE FORMULA SHOWN BETWEEN THE TWO POINTS. As mentioned, when studying this template, I found that it exhibits extraordinary characteristics and properties useful to perform general design works, especially of pyramids. Therefore, I decided to call it, the “Perfect Symbol”. To prove the template’s usefulness for design, and considering its triangular shape, which appears very similar to the cross section of a pyramid, I decided to use it to create a geometric design of an Egyptian Pyramid’s model, without the use of numbers, calculations, formulas, or any reference to the Great Pyramid’s structure dimensions. When my design was finished, I had created a geometric dimensionless plan, which looks equal to the Great Pyramid’s structure. The design plan shows a dimensionless geometric plan created by means of the design template tool and a geometrical process. 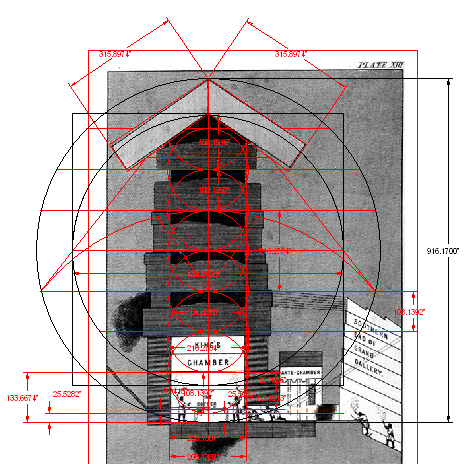 After he finished his dimensionless plan, In order to define the entire designed structure, I set up a number with its unit of measurement to the radius of the circle and calculated all the sections of the dimensionless designed structure. All of these calculations independently calculated from the dimensions of the Great Pyramid’s structure. 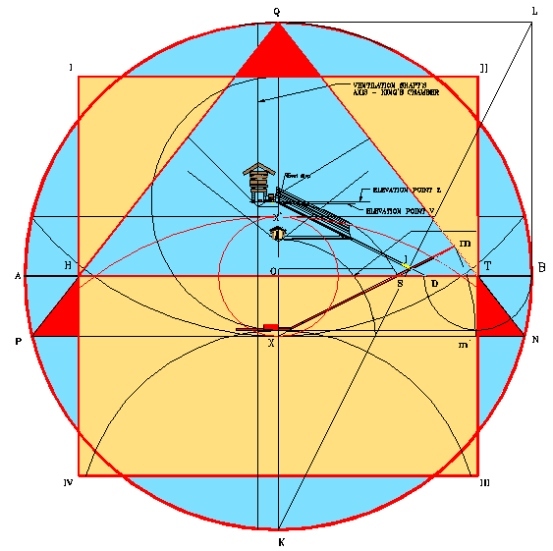 When I finished the calculations of the dimensionless pyramid’s model plan, I discovered that my designed pyramid’s model plan was entirely equal in dimensions, characteristics and properties to the existing “as built” plan drawn using the dimensions measured by surveyors and pyramid’s investigators, for the Great Pyramid’s structure. I subjected both plans to a thorough and comprehensive comparison and found that both plans proved to be exactly equal in all their dimensions, characteristics and properties. 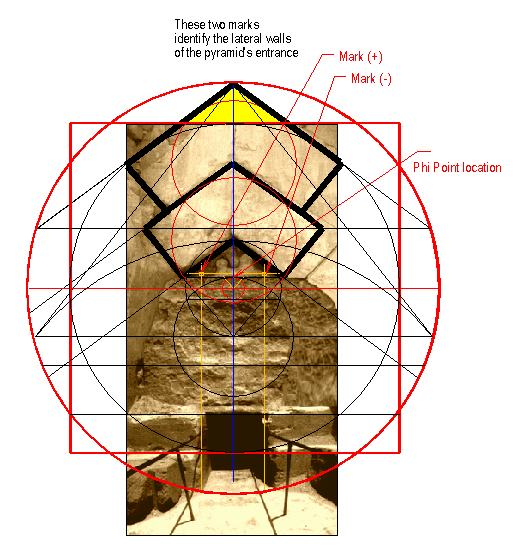 This proved that the “Perfect Symbol” as I called it, is the origin of the structure shape and the frame of the Great Pyramid. My report books illustrate step by step, all these processes. My intention was to generously make available my findings and discoveries “free” to the Egyptian Government officials, for their revision and used accordingly in their benefit. Up to now, after 4 years, no response was ever received from them. Since I considered this material very important for the world and the Egyptian History, I uploaded my books to my web site http://www.samuellaboy for all to read. In addition, my books are available for all at amazon.com. However, I would ask Egyptologists interested in these matters, to take my running-stick and continue the run to the finish-line, to gain the lost, space and time in history, for the benefit of the mankind. With my books, you will be learning a completely new course about the pyramids. My books present new findings and discoveries, not exposed before by any other author, or by any other books. The following figure shows the dimensions as calculated for the pyramid’s model plan. They proved to be exactly equal to those measured at the Great Pyramid’s structure. As something incredible, most of the dimensions shown in both plans, my designed plan, and those measured by surveyors and pyramid investigators of the Great Pyramid’s structure, were accurate to decimal places. 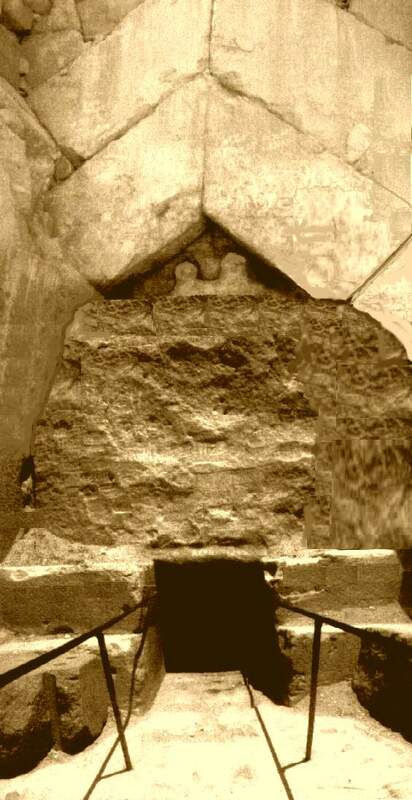 It is also known that this accuracy is something very difficult to be accomplished by the Egyptian manual labor, considering that the dimensions of the pyramid’s structure were set using large and heavy stone blocks, which needed to be cut and placed exactly to fit dimensional specifications. It is known that the fact that both plans proved to be exactly equal in all dimensions, characteristics and properties is something that only can occur if both plans were designed following equal guides and procedures. This discovery is something that scholars, all pyramid lovers, and investigators from related sciences, should carefully look at. This is something real, it is a fact. There is no doubt that this discovery will have to be finally recognized by all experts. Any person, in any country, in any language, using any units of measurements, can verify that all this presentation is real and completely correct. This discovery reveals for the first time in history, that the “Perfect Symbol is “the origin of the Great Pyramid” and also its frame for its construction. The fact that the entire Great Pyramid’s structure can be established, without the use of numbers, calculations, formulas, or reference to the Great Pyramid’s dimensions is astonishing. Plus the fact that only one number with its unit of measurement, independent from the Egyptian units of measurement, is used as the radius of the template to calculate all the Great Pyramid’s dimensions makes it unbelievable. This also means that all dimensions set up in the Great Pyramid’s structure were set up by geometry, and not by the builders. All details and references about all of these can be found in Laboy’s report books. 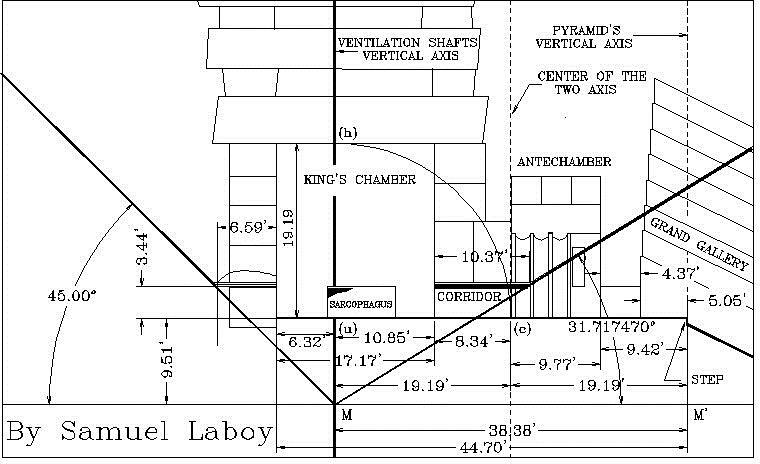 To verify his design method and the use of the Perfect Symbol, Laboy presented, using the same procedure with the “Perfect Symbol”, individually designs of the original “Great Pyramid’s entrance”, the Grand Gallery, the King’s Chamber and its five ceilings, the Queen Chamber, the Antechamber, the subterranean chamber, and even the so-called ventilation shafts lengths, and angles. To further verify his design methods, Laboy also designed the geometrical plans of the pyramids of Chephren, Micerinus, the Red, the Bent pyramid, and also of some ruined pyramids. His two reports books exposed to the world, his extraordinary findings and discoveries to determine the pyramids internal structure, the location of descending passages and entrances, and most important, the most probable location of the Pharaoh’s Mortuary Chambers. Esta entrada fue publicada en Arqueología del Antiguo Egipto, Autores y/o Investigadores, Pyramids of Giza y etiquetada Giza, Great Pyramid, Great Pyramid of Giza, King's Chamber, Leonardo da Vinci, mathematics pyramid, Oklahoma State University, samuel laboy, the Great Pyramid. Guarda el enlace permanente. Estimado, he descubierto este fin de semana tu blog, y estoy realmente fascinado. Espero que sigas adelante con él. Muchas gracias por tu trabajo.